These are the real teeth of the recession. If you are Hermes, at least. Fashion can be an ugly, reptile-eat-reptile world, and if things keep going as they are going for luxury goods purveyor Hermes it might have the counter ladies at Saks saying "That's not a handbag; this is a handbag." At the Global Luxury Summit in Paris yesterday (and, let's face it, the timing is sort of like having a bonfire next to a lava flow), Hermes CEO Patrick Thomas said the company has begun farming its own handbags, according to Reuters. Well, they start as crocodiles in Austraila, but wow. 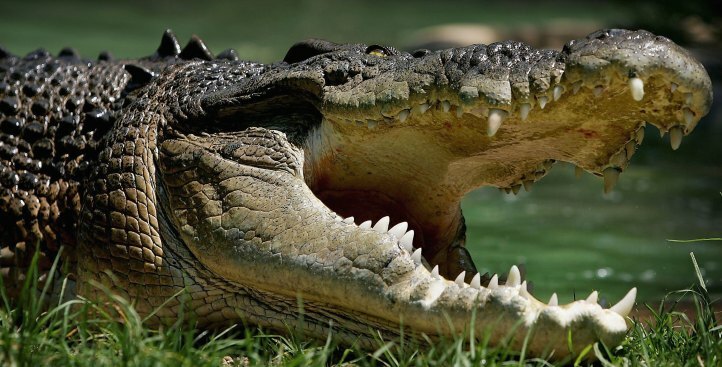 Croc skin bags can go for almost 50 grand and may take up to three scaly critters to make. The company produces 3,000 of the bags a year, and says Thomas, "The world is not full of crocodiles, except the stock exchange!" What a cut-up. Laugh hard fancy-man. Who do you think buys $50,000 handbags, anyway? Did you think your clients where Peace Corps volunteers? And talk about your men at work: Hermes sees its leather goods production jumping in teeth of a global recession and has added up to 100 leather workers and 20,000 craftsmen to its workforce this year. "We have massive demand," says Thomas. One imagines, they've also employed an out of work Paul Hogan to handle the crocs. The aggressive carnivores have to be kept apart on the farm or they tend to bite each other, damanging the merch.